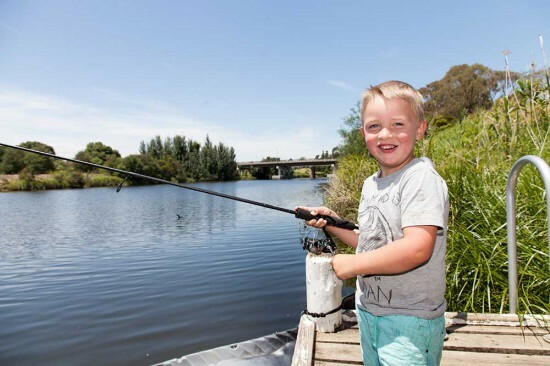 NRMA Bairnsdale Riverside Holiday Park is located on the banks of the Mitchell River, three and a half hours from Melbourne and eight hours from Sydney. The park has a range of accommodation including open plan, one and two bedroom cabins, as well as powered and unpowered sites for caravan and camping. Facilities include camp kitchen, barbecues, swimming pool, children’s swing set and WiFi. Enjoy fishing, rowing and kayaking along the river, the Buchan Caves, a self-guided rail trail tour, the region's wineries, Lakes Entrance, 90 Mile Beach and Metung. Enjoy a morning stroll or cycle along the picturesque track that runs through the park along the boardwalk to the Port of Bairnsdale, then on to the Lind Bridge and return across the swing bridge over the Backwater at Howitt Park (a round trip of approx 5.4 km). Or take the nearby East Gippsland Rail Trail - as a designated "Rail Trail" it is ideal for cycling or walking. It wends its way through the towns of Nicholson, Sarsfield and Bruthen and extends as far as Orbost in the east. Motorcyclists and motorists will find this the perfect base to enjoy the array of excellent touring routes, whether into the mountains to Dargo, Omeo or Buchan, or exploring the many coastal towns such as Paynesville, Metung and Lakes Entrance. Why not leave the car at NRMA Bairnsdale Riverside Holiday Park - we are just a short 500 metres stroll to Howett Park Play Ground, BMX Track, Boat ramp & skate park and a few minutes to the Bairnsdale CBD. Whatever your choice, NRMA Bairnsdale Riverside Holiday Park makes your perfect rest stop in East Gippsland.